Who is OK City Chorus? The OK City Chorus has a 60 year history of providing outstanding, show-stopping entertainment. 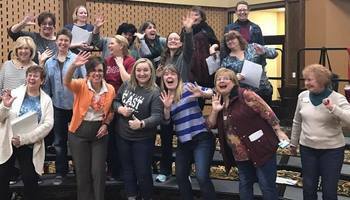 Made up of over 100 women from cities throughout Oklahoma, our goal is to preserve the American art form of 4-part, a cappella, barbershop music by “harmonizing the world." We rehearse every Tuesday evening at 6:30pm, at St. Luke's United Methodist Church, 222 NW 15th St, OKC 73103. Enjoy the Kentucky Derby with OK City Chorus! OK City Chorus in the National news! 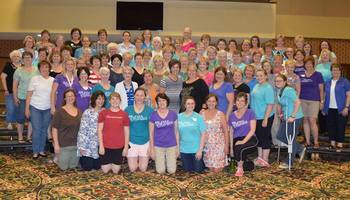 Want OK City Chorus to sing at your next function? Why not hire OK City Chorus to entertain at your next event? We can perform at corporate functions, charity events, community Entertainment events, birthday parties, christmas parties, awards nights, weddings, engagements, anniversaries, engagements, and even funerals and memorial services.